Lower fertilizer prices have been a welcome relief for producers facing falling commodity prices and farm incomes. Fertilizer prices offered big cost relief in 2016 and were the largest source of total cost reductions. These fertilizer price reductions came even with strong quantities of fertilizer demanded from a large corn crop; U.S. corn acreage was up 7% from 2015 and was the third highest acreage since 1944. Given lower fertilizer prices but strong usage from increased corn acres, this week’s post takes a look the prospects of even lower fertilizer prices again in 2017. The average prices for anhydrous ammonia, DAP, and potash in Illinois since 2010 are shown in figure 1. Anhydrous ammonia prices went from $500 per ton in early 2010 to peak at nearly $900 per ton in early 2013. Currently, Anhydrous Ammonia prices are again near $500 per ton. Potash prices were also nearly $500 per ton in 2010, but peaked earlier, in 2012, topping-out above $600 per ton. Current potash prices are well below 2010-levels at nearly $300 per ton. DAP prices, which were nearly $450 per ton in early 2010, peaked in early 2012 at more than $700 per ton. Today, DAP prices have returned to early 2010 levels. While the timing and magnitude of price changes varied across the three products, the general trend was consistent. Prices trended higher after 2010 and since mid-2013 settled lower. And while it’s difficult to observe in figure 1, fertilizer prices observed since August 2016 have all been at the lowest levels since 2010. This is also true for other types of fertilizer not shown in the graph including, urea, 28% liquid nitrogen, and MAP. Figure 1. 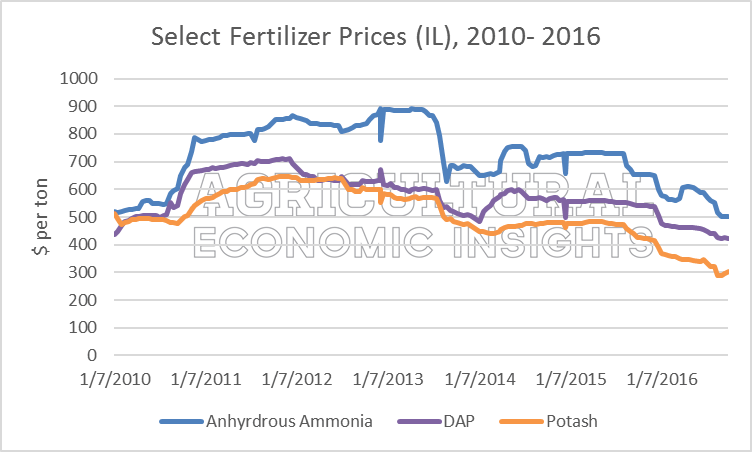 Illinois Fertilizer Price for Select Products – Anhydrous Ammonia, DAP, and Potash, 2010 – 2016. Data Source: Illinois Production Cost Report (USDA AMS). 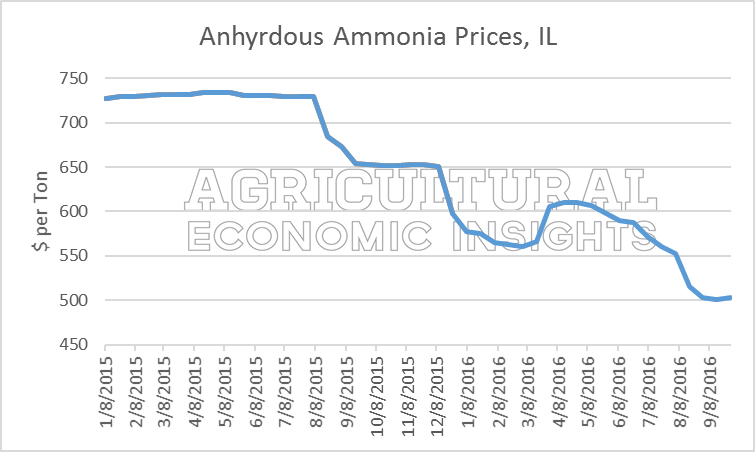 A closer look at recent price trends for anhydrous ammonia in Illinois can be seen in figure 2. After relative stability from January to August 2015, prices quickly ratcheted lower. From nearly $725 per ton in early 2015, we noted last Fall that prices fell more than 10%, to nearly $650 per ton. Right before 2016 planting began, prices fell an additional 15%, to roughly $550 per ton. They then ticked higher in April and May as the large acreage of corn planting got underway – inching above $600 per ton – but have since fallen to nearly $500 per ton. In the fewer than 2 years of data shown in figure 2, anhydrous ammonia prices went from $725 per ton in early 2015 to nearly $500 per ton recently. And while many expected lower fertilizer prices, the magnitude of the decline, more than a 31% decrease, is more than many likely expected. Figure 2. Average Price of Anhydrous Ammonia in Illinois, Jan. 2015 – Sep. 2016. Data Source: Illinois Production Cost Report (USDA AMS). Beyond anhydrous ammonia, figure 3 shows the changes in fertilizer prices from Spring 2016 – or the average prices for April to May- to September 2016. Nitrogen price – anhydrous ammonia, urea, and 28% liquid – have fallen the most (15-20%). DAP prices are off 8% and potash is down nearly 15%. And while it’s a little while before most farmers start applying corn fertilizer for 2017, the prospects of lower fertilizer again in 2017 is likely to help the improve crop budgets and support the overall outlook. Figure 3. 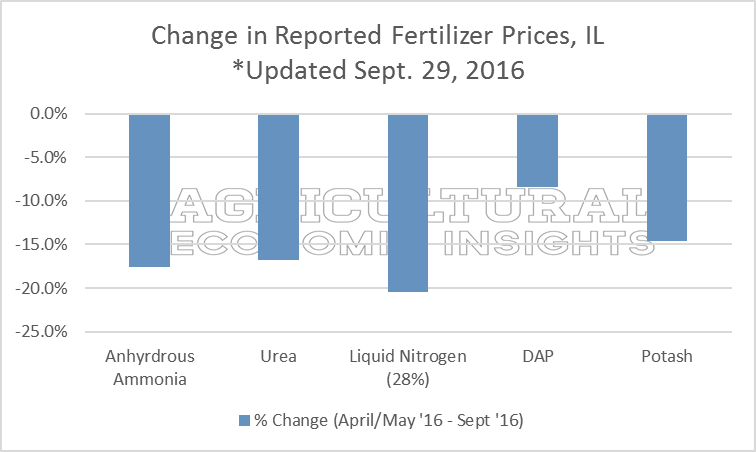 Change in Price of Select Fertilizer Prices in Illinois, Spring (April/May) 2016 to Sept. 2016. Data Source: Illinois Production Cost Report (USDA AMS). It’s important to consider the farm-level implications of these price declines. In figure 4, an estimated fertilizer expense for a 180-70-70 nutrient application (using anhydrous ammonia, DAP, and potash) is shown. Estimates from 2010 to 2016 utilize average Spring prices in Illinois (April and May) and the Fall 2016 estimate uses the average price in September. Fertilizer expenses were highest from 2011 to 2013 at around $160 per acre. In 2014 and 2015, prices shifted lower and this application would have cost nearly $140 per acre. In the Spring of 2016, the cost of this application dropped another $28 per acre, coming in at a total of $112 per acre. Today, Fall 2016 prices would bring the cost of this fertilization rate to $96 per acre, almost $16 per acre lower than Spring 2016 prices. At the end of the day, the fertilizer price declines have resulted in substantial cost reductions, with current fertilizer expenses for this type of application nearly 40% lower than 2014/2015 levels. Figure 4. Estimated Fertilizer Expense for Apply a Corn Fertilizer Rate of 180-70-70 using Anhydrous Ammonia, DAP, and Potash, 2010 – Fall 2016. Fertilizer Price Data: Illinois Production Cost Report (USDA AMS). Falling fertilizer prices have been an important driver in lowering costs of production. This was especially true for 2016 production. Considering the application rates that we used in this example, the fertilizer cost savings are $64 per acre from those seen in 2013. This is a large decline indeed. Looking to 2017, fertilizer prices have been softening considerably in recent months and could translate into another year of lower fertilizer prices for producers. 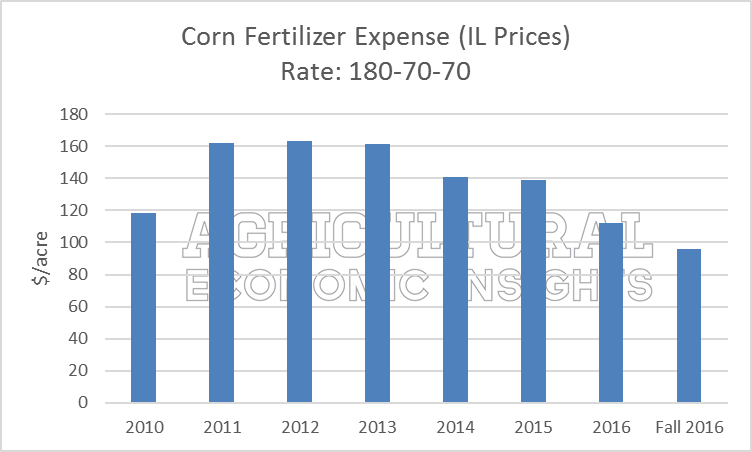 The declining prices have created the potential for another round of significant per acre cost reductions in fertilizer expenses. At present these fertilizer costs would be $16 per acre lower than 2016. While prices are currently lower than earlier this year, it will be important to monitor demand for fertilizer – especially the intended size of the 2017 U.S. corn acreage. While the large price declines observed over the last two years have been impressive, the declines are especially noteworthy considering amount of corn planted in 2016. Commodity prices, fertilizer prices, and crop acreages will all be important factors to watch over the winter.